Lillian Too at the FSML Conference in London - giving her talk on the 3 allictions of Flying Star and how to cope with them. Organized by Feng Shui For Modern Living magazine, this event attracted all the best names in feng shui and a great audience. It was indeed lovely to again meet with fellow feng shui practitioners, authors, masters and consultants. And what better way to do it than at the latest feng shui conference in London? We were entertained at the Riverside cafe, where everyone mingled and got to know one another. Held over three days, participants were given a choice of four speakers in each time slot. Lillian's talks were all brimming full and spilling over with her ever fantastic readers. 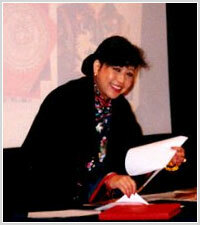 Master Yap Cheng Hai was there to teach flying stars and eight mansions feng shui. Our new friends Dragon Gate had a stall there and met many new friends and new customers. Helen and Michael Oon from Geomancer were also there with all their goodies. Front row from left to right: Nancy Santa Pietro (USA), Helen Oon (Geomancer, UK), Lillian Too (Malaysia), Jami Lin (USA) and Raymond Lo (Hong Kong). Back row from left to right: Derek Walters, Jennifer Too and Joel. Other names to grace the programme were Derek Walters, Jami Lin, William Spear, Raymond Lo and Nancy Santo Pietro. We'd like to thank Stephen Skinner of FSML for inviting us and we hope we keep in touch with the many new friends we made at this annual event. Next year should be even bigger and better! 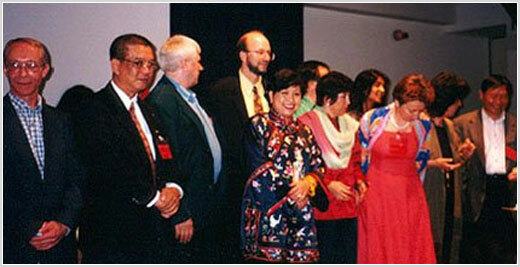 Left to right: Jon Sandifer (UK), Koh Poh Lin (Singapore), Derek Walters (UK), Stephen Skinner (FSML), Lillian Too (Malaysia), Jami Lin (USA), Gina Lazenby (UK), Nancy Santa Pietro (USA), Raymond Lo (Hong Kong).